Learn the basics of how to use the PDCA Cycle (Plan-Do-Check-Act), the very first quality improvement and effective project management tool in your arsenal when implementing kaizen. Achieve higher quality in your results and processes. Gain continual increases in work efficiency. Allows you to clearly see which stage your project is at. Assists you in handling your work logically and systematically. Simply put, PDCA is a way to reduce reliance on Murphy’s Law, and move from a reactive problem fixing model to a proactive one. The original concept was made popular by statistician Edwards Deming, the father of modern quality management. 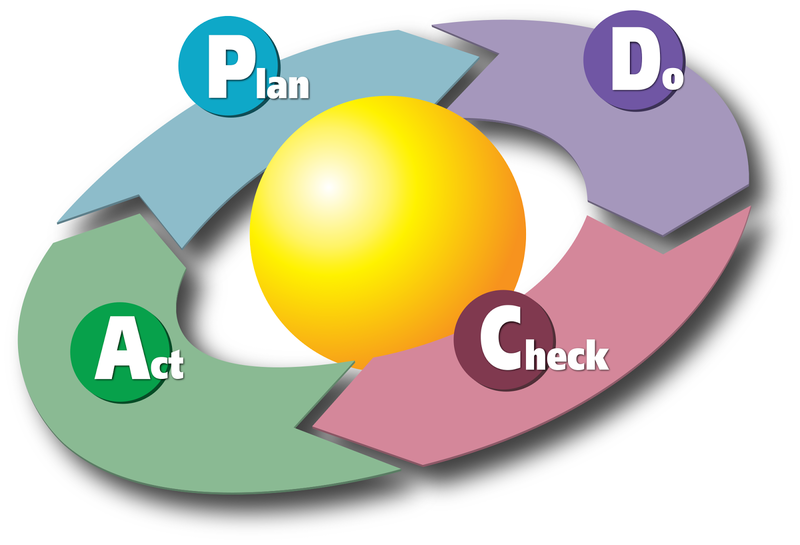 PDCA is quite easy to understand and quite easy to carry out, as long as you keep track at which stage you’re in. To carry PDCA out, you need to follow the four step cycle as in the diagram above. Firstly, you start with Plan. After that, take an all-encompassing look at the project. There are usually some key areas where you’ve felt that could improve project efficiency, or where you could have done something better. Brainstorm, and identify areas for improvement. 1 The caterer delivered food 2 hours late. Why did this happen? 2 Because we did not prepare the purchase order on time. Why was the purchase order not prepared on time? 3 Because we did not get all approval signatures on time. Why didn’t get the signatures on time? 4 Because we prepared the PO 3 days before the event. Why did we prepare it late? 5 Because we forgot to prepare the PO. Why did we forget about it? Root Cause: Because we didn’t have a checklist to clearly identify the tasks we needed to complete at what time. In this case, one of the root causes is that we lacked a checklist to ensure everything was prepared at the designated time. There are a series of detailed articles on the purpose of 5-why, as well as downloadable tools and tutorials here. Once the root causes are eliminated, it is important to standardize these techniques in order to ensure that everyone knows about it, and that they don’t happen again. That can be achieved through documentation and sharing this knowledge through PDCA meetings with your team, and other stakeholders. After you’ve finished the Act portion, you go right back to Planning the next stage of the project. Don’t forget to use what you have learned during the PDCA loop to make the project even better next time. P = Plan your work well. A = Act to fix the root causes. I have uploaded the PDCA diagram seen above to share in the Wikimedia Commons as a SVG file, which means you can resize it in a vector editing program such as Adobe Illustrator or Inkscape. Alternatively, Wikimedia Commons also has an option to generate the SVG into a PNG file, which means you can use it immediately in your Word documents or PowerPoint presentations immediately without any further editing. You can read more about horenso (effective communication), PDCA (Plan-Do-Check-Act), mieruka (use of visuals) and 5-why here, which also includes articles, tutorials and downloadable diagrams, sheets, PDFs and other tools to help you implement kaizen and bring the competitive edge of the Toyota Way to your manufacturing or service-industry project or organization.